A high intensity Electromagnetic Filter has expanded the mineral testing capabilities in the Master Magnets mineral processing laboratory. The Electromagnetic Filter is designed to remove fine iron and weakly magnetic materials from mineral slurries and ceramics slips and glazes. 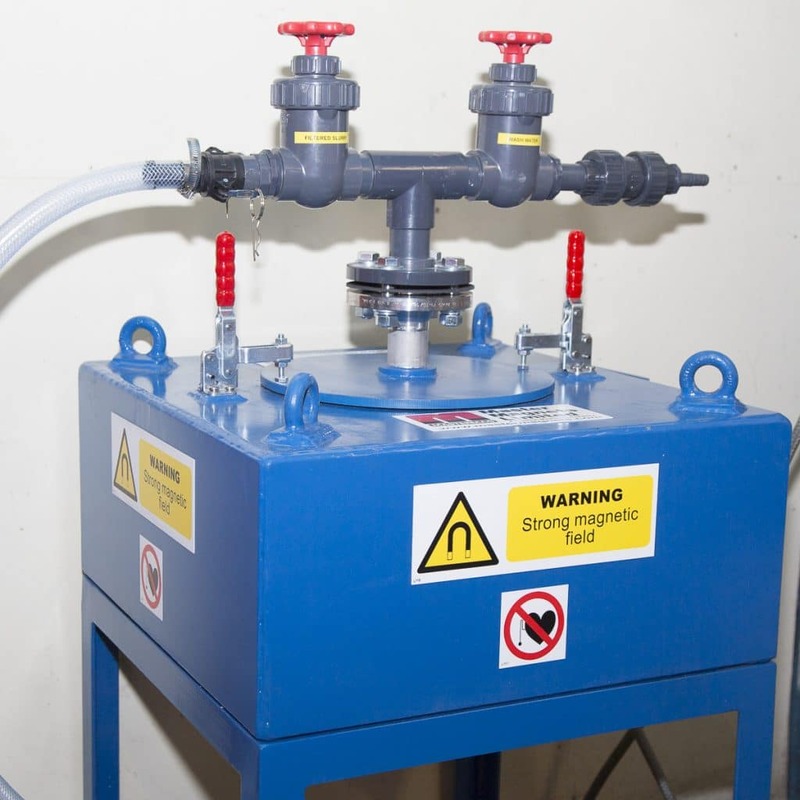 The new equipment expands the extensive range of high intensity magnetic separators already used in the test laboratory. The Electromagnetic Filter is designed to project a strong magnetic field into the centre of an electromagnetic coil. The centre is hollow and fitted with a matrix. The matrix intensifies the magnetic field. Slurry is fed up through the matrix at a governed rate and magnetically susceptible minerals and particles are attracted to the intense magnetic field on the points of the matrix. Once the matrix is loaded with magnetics, the feed is stopped and the magnetic field is turned off. Water is then flushed through the matrix to clean away the captured magnetics. Continuous processing occurs when two Electromagnetic Filters are installed and operated in a flip-flop arrangement. When Electromagnetic Filter A is cleaning, B is processing and visa-versa. The Electromagnetic Filter is an environmentally-friendly mechanical process. The separation capabilities are often similar to flotation without the use of chemicals. Successful applications include the purification of silica sands for the glass industry as well as feldspar and ball clay for the ceramics industry. 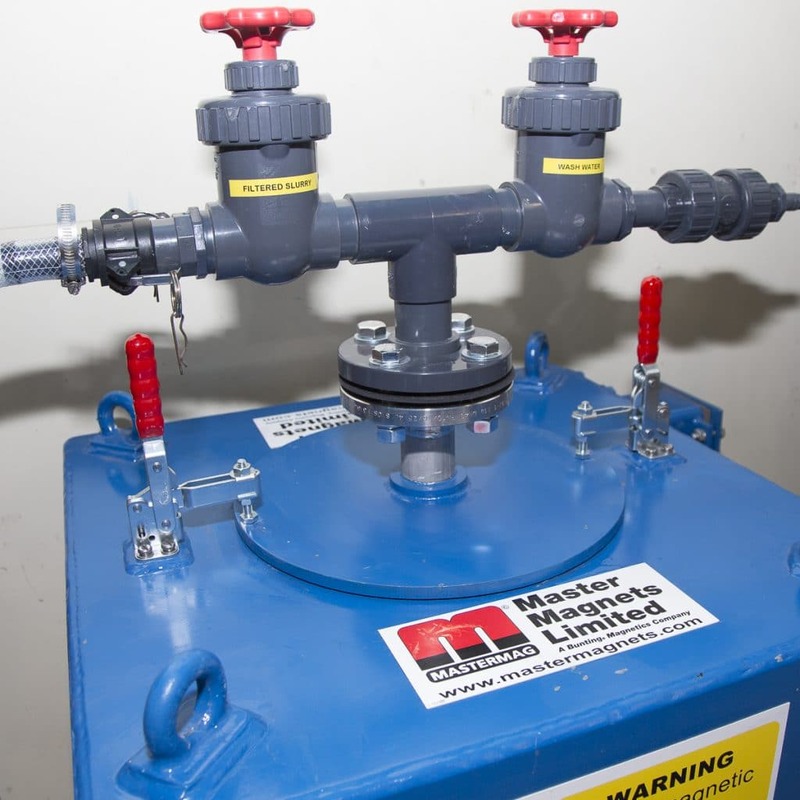 Controlled tests in the laboratory confirm separation capabilities and provide the basis for project guarantees. Low intensity Electromagnetic Filters are a common feature of most ceramic plants. The higher intensity versions enable the capture of very fine magnetics as well as coarser magnetic particles. Successfully removing the magnetics reduces product defects and improves the whiteness of glazes.